The Living Rosary Association was founded by Venerable Pauline Marie Jaricot at Lyon, France in 1826, at the age of 27. She first founded the Propagation of the Faith at the age of twenty. Pauline was a close friend of Saint Jean Marie Vianney, the CurÉ of Ars. It was approved and richly indulgenced by Pope Gregory XVI, and accorded official canonical status on January 27, 1832. The Living Rosary Association began its revival on December 8, 1986, with 30 local members. Blessed 1000-fold by Our Lady and under the powerful patronage of St. Philomena, the membership is now 11,369,699 and has been planted in every continent of the world. Over 3/4 of the membership lives in foreign and Third World countries. Each member is asked to voluntarily give a small monthly donation. There is no other financial support other than from its members. The funds received are placed directly back into the work of our Missionary Centers around the world. For those who are unable to contribute a monetary donation, we ask for your fervent prayers that our material needs are met. Let us reach all souls with the spiritual remedy of the Living Rosary! To register as a member of the Living Rosary, please click here. A list of 15 names will be assembled, and when the Rosary is complete, the decade you have been assigned and the day to begin will be sent to you. Partnered in prayer with Our Lady for the Salvation of the World! The Triumph of the Immaculate Heart of Mary and in honor of St. Philomena our patroness and protectress. The Living Rosary is a “perpetual" Rosary! That is, you accept the obligation to pray your daily Mystery faithfully for the remainder of your life. These obligations do not bind under pain of sin, but your effort and desire to remain faithful are necessary. If you should decide that you can no longer fulfill your obligation, we do understand. Our only concern is to keep the Rosaries complete. Please do let us know if you can no longer participate so that we may reassign your Mystery. Have courage, my dear children! I exhort you to fight against the persecution of the Church and against anarchy, not with the sword, but with the rosary, with prayer and good example. A regular Spring and Winter newsletter, “Dedicated Decades", is posted to each member in an effort to encourage all to persevere and remain faithful. The individual devotion of isolated souls is often a spark in the middle of darkness without the influence of a flame. Through our union of charity in prayer and intention, this spiritual remedy is 'injected' into the souls of all who participate as "spiritual medicine". In this way, those who are strong uphold the weak; those who are fervent inspire the lukewarm and the spiritually rich enrich the poor: BRING THEM TOGETHER AND YOU HAVE A FURNACE! One who prays the Rosary alone receives the grace of one Rosary but, if he is united with many, he gains the graces and merits of the whole. Your Decade may be offered at any time of the day or night. 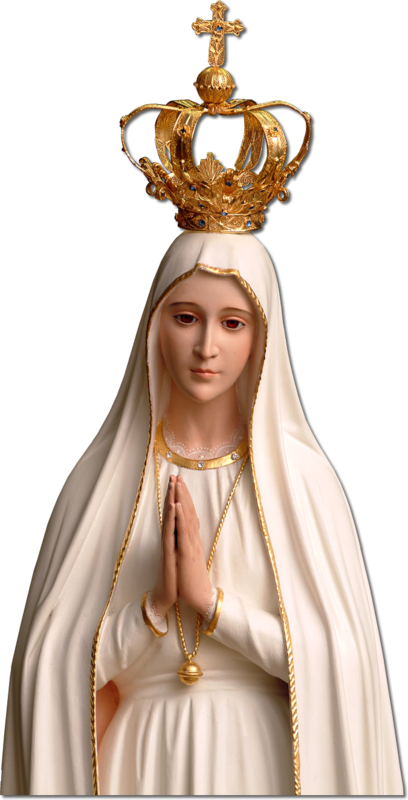 The Living Rosary Associates must pray daily one OUR FATHER, ten HAIL MARY’s and one GLORY BE, accompanied by meditation on the Mystery assigned. It is recommended that this be done during the morning hours. The graces of this great union of prayer will fortify and strengthen you for the many difficulties and duties of your busy and demanding day. Any time of the day or night and in any place – no need to gather in a group. $1.00 a month will help us meet the expenses of the Apostolate. “Many Christian nations seek the protection of the Mother of God with an ardor that grows greater every day; may they cling more and more to the practice of the Holy Rosary, not only as a remedy for their misfortunes, but as the very badge of Christian piety! The Rosary is the protection of the Mother of God against the enemies of the Catholic Church. To Mary we must fly. We wish to see it offered more widely in all places and at all times! The great virgin of the Rosary is the most potent help of Christians." Mary worked through St. Dominic and now works through us to pray the Rosary to rescue Her children from the powers of Satan and into the abundant life found in Christ our Savior. May Christ dwell in our hearts through faith, and may charity be the root and foundation of our life. Following the example of the Venerable Pauline Jaricot, who founded the work of “a penny a week” for the Propagation of the Faith, you and your family may also consider dedicating monetary support equivalent to a meal a month or other offering to the Living Rosary. 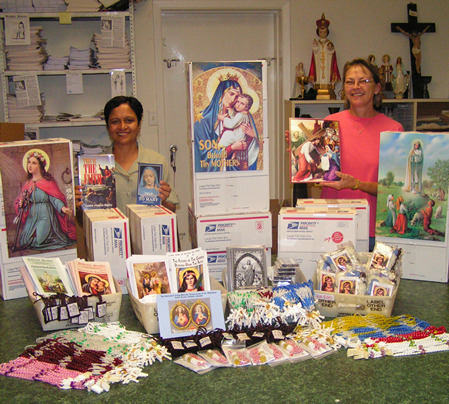 Universal Living Rosary Association of St. Philomena is a nonprofit Corporation 501(c)(3) charitable organization and as such we automatically give "Tax Receipts" to all those who make a financial donation. For those who donate $100 or more, a “TRIDUUM of MASSES” will be arranged for the donor and his/her family. Thirty dollars of every $100 donated supports the missionary who will offer these masses. Through your help, the prayers of the missions will continue to work miracles in the lives of all of its members and families, thus strengthening the Mystical Body of Christ.